CoolerKING®, our commercial refrigerator filter, and Polar Fresh®, our residential refrigerator filter, have the same proprietary blend of natural minerals. This page includes scientific explanations and tests that may have been conducted on one of the products but the results apply to both products. These unique minerals were formed millions of years ago as a result of volcanic activity beneath ancient desert lake beds. Awesome forces of nature combined to form this remarkable family of minerals which absorb and release water vapor and absorb specific gas molecules. The physical structure of zeolite is arranged in an interconnecting lattice structure. This structure is arranged to form a honeycomb framework of interconnecting channels that are consistent in diameter. The diameter of these open channels is what differentiates each type of zeolite and is what gives rise to their unique properties. Within these channels are positively charged ions (cations) attached and held by the structure's negative charge. The ability to absorb/desorb water vapor without chemical or physical change in the zeolite structure. The ability to selectively absorb specific gas molecules. The ability to exchange one cation for another determined by ion size and channel diameter. Zeolites are some of the most efficient ion exchangers known. Tahoe Food Technologies, Inc. evaluated our special blend of natural minerals to determine its effect on refrigerated food. Every type of food is affected by different forms of microbiological growth. Tahoe Food Technologies studied the effect of yeast, mold and bacteria on strawberries and the effect of yeast and mold on lettuce in a refrigerator with and without Polar Fresh® for a 10 day period. The test results show how our blend of natural minerals inhibits the growth of bacteria, yeast and mold on selected food samples. Using Polar Fresh® / CoolerKING® in your refrigerator will create a safer food storage environment so you can serve fresher food and reduce costly waste due to spoilage. How fresh is your food? Cox Technologies, Inc. study on how temperature abuses during distribution affects the shelf life food. Conducted by: Electrical Systems Testing, Inc. Determine the amount of KW Hour demand and compressor running time, with and without Humidity Control Systems "CoolerKING®" units in place. Determine how well the temperature was maintained especially during peak times and defrost cycles. Data from April 26 through April 30 without CoolerKING® installed. 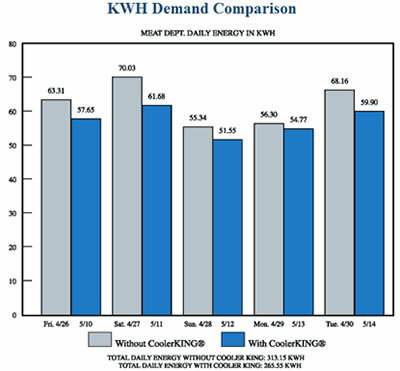 Data from May 10 through May 14 with CoolerKING® installed. The results with CoolerKING® installed showed a 9% reduction in running time of the compressor and a 9% reduction in kWh Demand. Refrigerator temperatures without CoolerKING® installed peaked into the fifties on a regular basis. In refrigerators with CoolerKING® installed this occurred infrequently. Without the system installed, the compressor ran longer in order to bring the temperatures down. The temperatures were also monitored at other test sights and in all instances they dropped and remained consistently lower throughout the day. Polar Fresh® is comprised of a special blend of "activated" natural zeolite minerals. The non-soluble, crystalline structure containing infinite, microscopic channel ways allows the passage of air to flow through. Because the mineral possess a naturally occurring, negative ionic charge it is able to attract and hold on to moisture, odor and any other airborne contaminants. Polar Fresh® controls the relative humidity inside a refrigerator by absorbing excess moisture then releasing purified moisture back into the refrigerator (when needed) resulting in optimum levels for food storage. Polar Fresh® results in several important benefits for the refrigerator and the food in it. Food stays fresher and lasts longer. Odor is eliminated and prevented. Ethylene Gas and other food spoiling gases/contaminates are controlled. Excess moisture that provides a breeding ground for bacteria is curtailed. Temperature is reduced creating a drier, crisper cold. a safer food storage environment. less run time which equals energy savings. Baking soda is a natural mineral that is highly alkaline in content. For this reason it acts as a "base" and will neutralize odors that are primarily acidic in makeup. Its only function is to neutralize odor. When placed inside a refrigerator, baking soda will eliminate existing odors for a short time. As soon as moisture builds up on the surface it tends to crust over, rendering it ineffective from that point onward.